Bled, Slovenia — IN SLOVENIA, WHERE ONE in every 250 residents keeps bees, the hills are alive with the buzz of honey making. On a hot summer afternoon at a sidewalk cafe; here, it is often a bee, rather than a fly, that alights on the rim of your coffee cup or beer glass. The indigenous Carniolan gray bee thrives amid the diverse vegetation, pristine Alpine environment and forests that cover 60% of the country. The result is a mouthwatering variety of artisanal honeys, including fir, spruce, sweet chestnut, lime, maple and wild cherry — plus honey liqueurs and wines, and even beehive art — available everywhere from the stalls of Ljubljana’s Central Market to typical grocery stores and gift shops, as well as from the beekeepers themselves. The small artisanal producers’ patient attention to their hives yields thicker honeys with richer, more intense flavors than mass-produced honey. 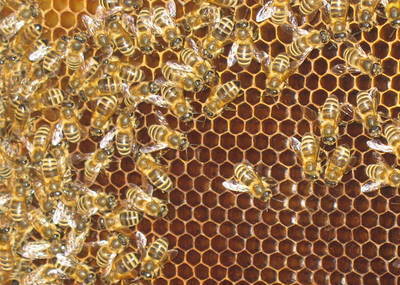 Slovenia‘s small apiaries refrain from harvesting honey until the bees build wax caps over the cells of their honeycombs, signaling that the honey is mature. Big producers, pressed for time, often harvest a more watery, unripe honey, which they then sometimes heat to reduce its moisture content. You can get a good look at the process at the Cebularski Muzej (Beekeeping Museum), in the baroque Thurn Manor in the tiny, well-preserved 400-year-old town center of Radovljica, less than 10 kilometers from Bled. From May through October, the museum’s centerpiece is an active, transparent beehive. The museum focuses on the Carniolan bee (prized for its gentleness — it won’t attack humans unless its home is threatened) and local beekeepers who, by the 16th century, had pioneered a form of apiculture in which wooden hives are stacked together in several rows and housed under one roof. Most Slovenian beekeepers today still group their hives this way, although their apicultural methods have changed, says Franc Sivic, vice president of the Slovenian Beekeepers’ Association and a prolific photographer whose close-ups of bees are featured in the museum. In the mid-18th century, busy hives inspired local artists who used the rectangular wooden front panels as their canvases. A single bee house offered dozens of panels on which to paint religious figures, scenes of bucolic bliss and illustrations of human weakness: On one, the devil sharpens a gossipy woman’s tongue on a whetstone; on another, soldiers sneak up behind their enemies. These open-air galleries made it easier for the queen bee to find her way home after mating. The museum features nearly 200 panels of antique apiary-inspired art. Beehive panel reproductions (19 euros) are found in the museum’s gift shop, along with sweet-smelling hive-shaped candles (3.30 euros), honey cookies (1.60 euros), jars of cinnamon- and chocolate-laced honey (2.50 euros), chestnut, flower, fir and forest honeys (4 euros-7.50 euros), apiculture books (4 euros-19.20 euros) and the children’s book “From Hunny-Bee’s Diary” (10 euros), available in English and Slovenian versions. Next head to Bostjan and Anton Noc Beekeeping in the village of Zirovnica, about nine kilometers from Radovljica. Although the operation and shop are named for the father and son who head the business, the whole family is involved. Bostjan Noc’s wife, Vanja, makes award-winning honey wine and acts as the family’s English interpreter; his nephew Jaka, 11, already tends his own bees. The family hives are mobile: A truck bearing a two-meter-high bee house stacked with up to 90 hives can be moved to catch the best pollen on any given day. (The local call-in farm report provides daily pollen counts.) Although no elaborate pictures grace the hives, their rectangular fronts are painted in eye-catching shades of blue, green, red, yellow, purple and pink. In summer, the family brings customers to their hives to watch as they collect and process the honey. Visitors can even don mesh-covered beekeeper’s hats and gear to help remove it. The family shop, nearly wallpapered in prize certificates, sells chestnut, spruce, fir, acacia, blossom, forest, lime, and flower honeys (1.60 euros-14.60 euros), as well as propolis, the bud resin that bees use as glue, which is valued for its healing powers (2 euros), deliciously sweet honey wine (6 euros) and honey liqueur (6 euros). In the nearby village of Begunje na Goreskem, near the striking yellow 18th-century St. Urh’s Church, Janez Luznar’s colorful bee house hums against a backdrop of snow-capped Alps. A third-generation beekeeper, he sells a dark, rich-tasting fir honey, plus lime, chestnut, dandelion, spruce, forest, and blossom varieties (3.50 euros-7 euros) and beeswax crafts such as a nativity set (30 euros). Back in Bled, you can stroll around the lake, cross it by boat to reach the baroque Church of the Assumption, hike beside the turquoise river of the nearby Vintgar Gorge, or visit Bled Castle, whose museum will reopen this spring with a new exhibition on the history of the frequently beleaguered region. Though hardly seen as a weapon of destruction today, invaders once felt the sting of Slovenia‘s beekeeping tradition. In the 16th century, locals defended their fortresses from invading Turks by hurling angry hives on their heads. Fortunately, today’s Slovenian beekeepers can afford to be much more welcoming to visitors. Congratulations on a fine article, Jennifer. If you’re looking for another subject,I recommend a trip to Planica for next years ski jumping weekend. I went to this year’s event and was amazed. Did you get any photos of carvings on hives? I’m putting up a second log hive and am thinking about an old world carving that would grace the front through which the bees would fly. Hi, Pat! Unfortunately, I don’t have any photos of carvings on hives. That sounds beautiful, though. Good luck with the hive!